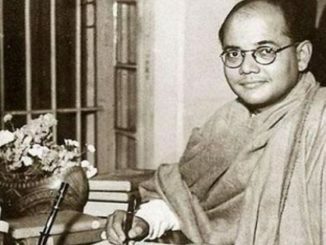 It is always told in public that the killer who killed our father of nation Mohandas Karamchand Gandhi, honourably and lovingly called Mahatma and Bapu respectively was not a right winger and he was mentally retarded. However, the way, right wing organisations, the RSS offshoots celebrate Bapu’s assassination anniversary it is crystal clear that the right wing organisations merely mislead the nation. The story of Hindu Mahasabha leader shooting at Mahatma’s effigy to embarass the father of nation is not new. Every year a new story comes up from these self styled brigadiers of Hindutva. Gandhi who was a practising Hindu and called himself a Sanatani Hindu was killed by the frontiers of so called Hindutva on 30 January 1948 just after a few months India got independence. His assassination is celebrated every year as Shaurya Diwas by right wing Hindu organisations. 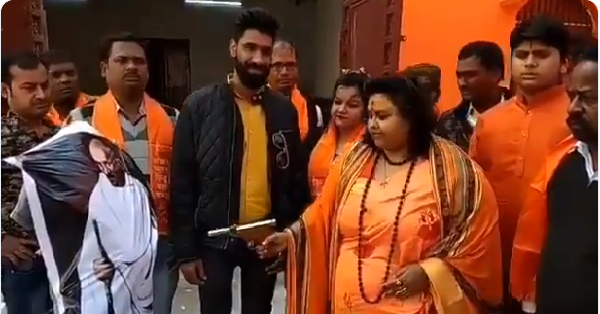 A video, showing Hindu Mahasabha’s National Secretary Puja Shakun Pandey, shooting at the Gandhi effigy, to celebrate the occasion, has gone viral on social media. Pandey shoots at the effigy, ‘blood’ was seen oozing out of it. Reports suggest that Pandey also distributed sweets among her supporters and fellow Mahasabha members. This is not the first publicity stunt by Pandey. In September last year, Pandey had threatened to kill herself, seeking the Prime Minister’s “permission” to commit euthanasia if the amendments to SC/ST Act were not withdrawn. She had also sent a letter to the PM which was signed in blood by her and 14 other Mahasabha members as per their claim. She had also been appointed as a judge to the ‘Hindu Courts’ set up by Mahasabha on the pattern of ‘Shariat courts’.